I had my fist taste of Boscaiola Pizza about a week ago and decided to go back for more a few days later. 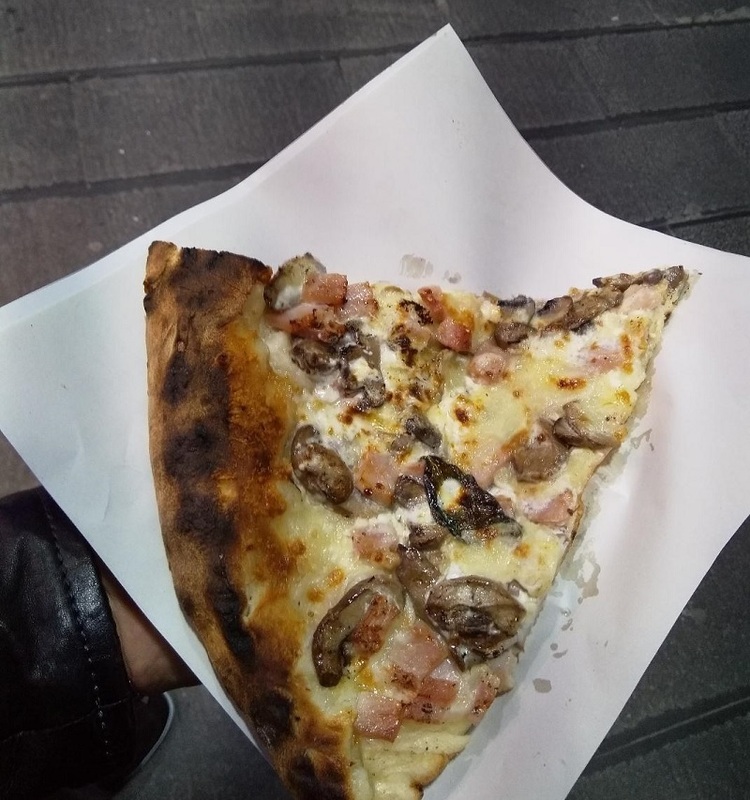 I bought both slices from a small food takeaway near the center of Naples and ate them sitting at a table placed in the street. It only cost me €3 per slice and it was easily the best tasting Pizza I have ever had in my life. Apart from being the first time I’d eaten Boscaiola Pizza, it was also the first time I’d ever eaten a genuine Italian pizza. Although I never realized it when I arrived in Italy, as far as pizzas go, I probably couldn’t have chosen a better city. Naples is alleged to be the place where pizzas were invented. Some people dispute the claim, but the city still has a reputation for producing the best pizzas in the world. The fist time I ate the pizza I didn’t even know what it was called, but I’m not ashamed of my ignorance. When I went back the second time I made a point of asking the guy who served me what type of pizza it was. He had no idea but said it was a kind of fungi pizza. Looking at all the mushrooms, I could see that for myself, but there was meat and other things too. I was surprised that the guy did not know what it was. There he was, working in a Neapolitan Pizza shop and he didn’t know what kind of Pizza he was selling me. He asked the girl who was warming up my slice of pizza. She didn’t know either. Finally, he posed the question to the guy who was busy making more pizzas. He had the answer and I learned my new favourite pizza goes by the name Boscaiola. I did some research and discovered, like most of the best pizza recipes, it was created here in Napoli. Unfortunately, I couldn’t find out much more.